The shed we inherited from the previous plot holder(s) may have gone, but some of its contents live on. 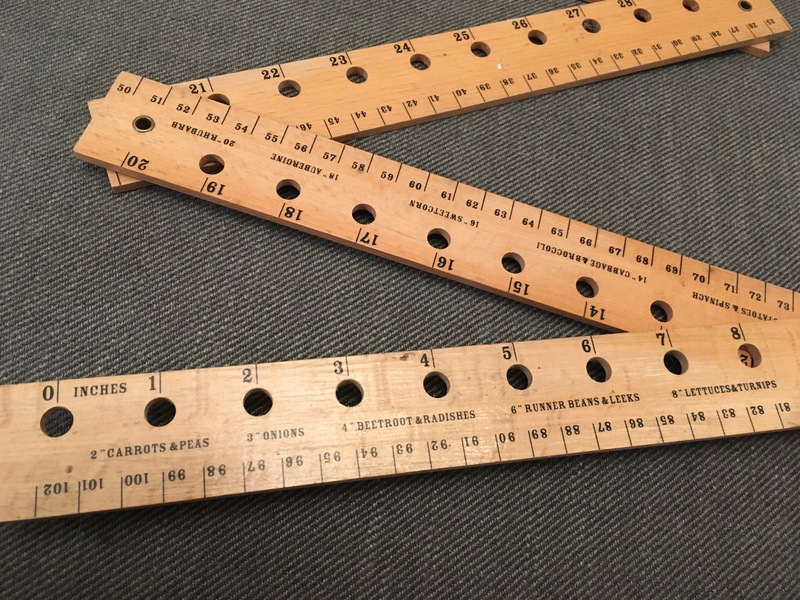 It’s a seed planting ruler, an articulated measuring instrument with holes at varying distances and information stating how far apart various vegetables should be planted. 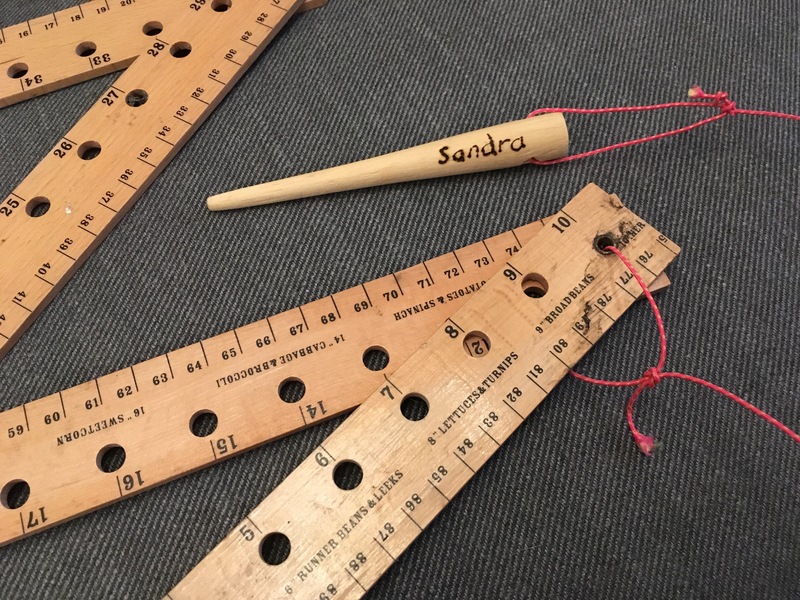 Unfortunately, it was missing the dibber that goes through the holes and into the soil, marking where to plant the seeds. So, Andrew made a new one, which he has tied on so that it doesn’t go missing. It’s even got my name on it! 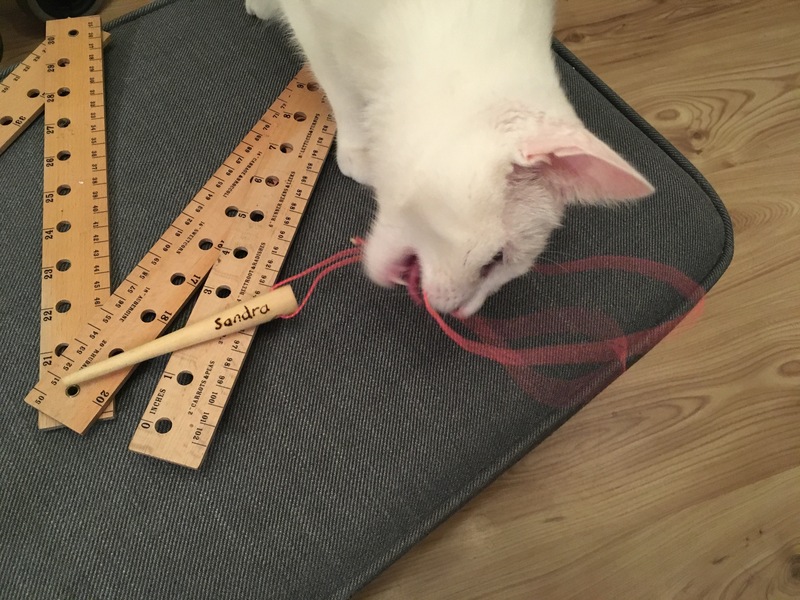 Now, we just have to persuade Pearl that it’s not a cat toy. 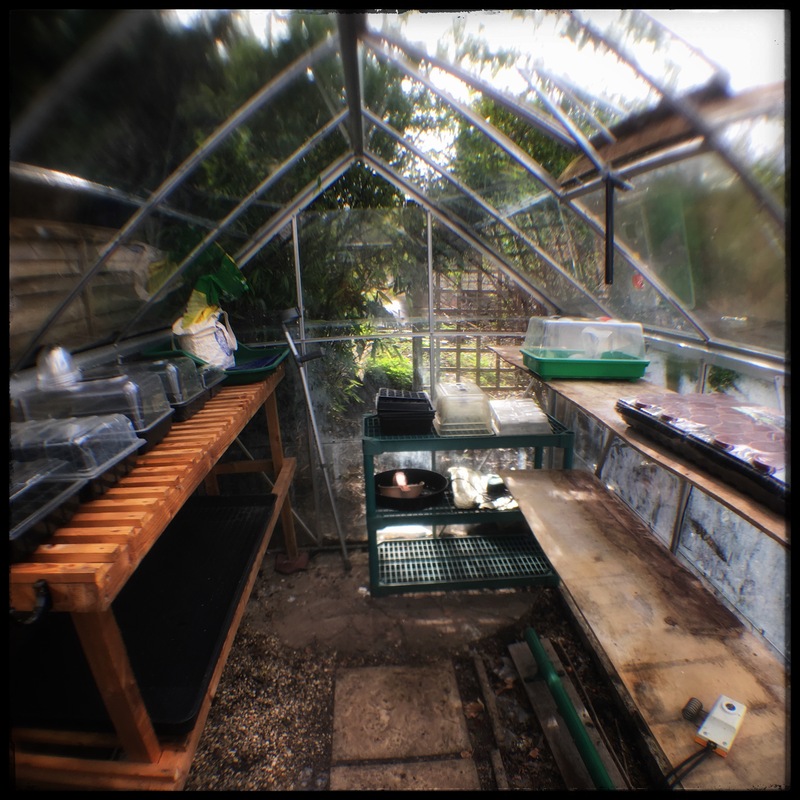 We don’t have a garden at Quest for Veg HQ, so we were delighted when our friend Richard offered us the use of his heated greenhouse. He even cleaned it out for us! This gives us the opportunity to get going with plants that need a little bit of heat to start them off. We decided to begin with a couple of varieties fo tomato from a packet of Mr Fothergills seeds from the front of the March edition of Grow Your Own magazine. So here’s Andrew explaining to me how to sow my first tomatoes! Chitting potatoes – my top 5 questions answered! Chitting is the process of causing potatoes to sprout before you plant them. But how do you chit and why do you need to do it in the first place? Most gardeners chit their potatoes but you don’t absolutely have to. If you plant them straight into the ground, all being well, they will grow. However, chitting allows the potato to develop strong shoots ahead of being planted. By placing the potato in the light, the shoots it develops will be sturdy and green, rather than the leggy white shoots that grow when the potato is placed in the dark. So chitting gets the potatoes off to a good start and may give you an earlier crop. In the video, we mention removing all but two of the developing shoots. Not everyone does this. The idea is that removing some of the shoots, is that having fewer stems prevents the plant from becoming overcrowded. There is less competition for water, nutrients and light, creating stronger plants that are less susceptible to pests and diseases. And more of the plant’s energy will go into creating a better crop of potatoes. As with many things in gardening, whether you remove shoots or not may simply depend on what you learned with you first started to grow. So, this year we are going to try growing half our crop with all the shoots that develop, and half where we leave only two in place. We’ll let you know how we get on in a later blog. Whatever way you go, when the shoots grow to between 1-2cm, they are ready to be planted out. 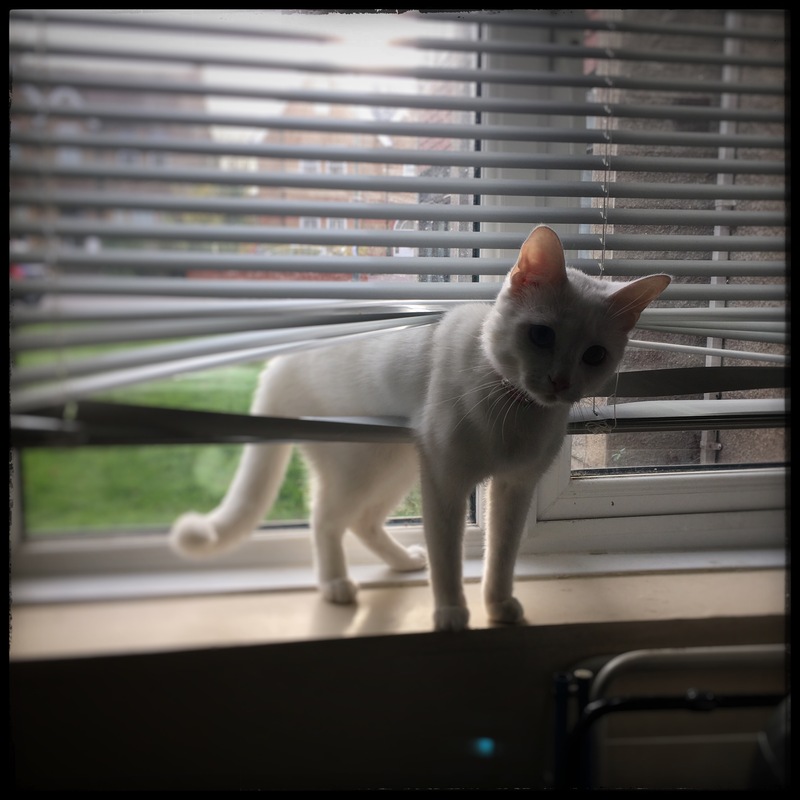 What if you set out your seed potatoes and some are the wrong way up? They’ll still sprout. The plant is preprogrammed to know which way is up, so they’ll send out shoots which will seek to grow up. You may want to lift your potatoes while they’re chitting to check them for white shoots, and turn them the right way up. Why use seed potatoes rather than just growing from potatoes bought in the supermarket? Potatoes are susceptible to many viral diseases which can be carried over from one year to the next. This is why it is a good idea to buy seed potatoes. When you buy seed potatoes, you are paying for certified crop. This means that you are buying named varieties grown in special conditions, and that they are inspected and tested to ensure quality and are then certified as disease free. Potatoes grown for food are just not produced and stored in the same way. They may also have been treated with sprout inhibitors or to have been irradiated, which delays or eliminates sprouting. So, even if you can get them to sprout, you are likely to find that the plants don’t have the same vigor and/or produce a poor quality harvest. Can you cut up your seed potato to create more plants? You can although there is a risk of introducing disease through the cut surface. You can manage that by using an antifungal treatment – a light dusting of yellow sulphur can help (not too much). If you decide to cut your potatoes, wait until you’re ready to plant them out. When you divide them, make sure that each piece has a couple of shoots (chits). My seed potatoes have gone wrinkly. Does that mean they’re no good? As long as they were not wrinkly before chitting, they should be fine. Seed potatoes can go wrinkly during the chitting process because the shoots begin photosynthesising. This involves giving off water and oxygen, and the potato shrinks but the skin does not, making them appear wrinkled. But the potato should still be good to plant out. We hope you’ve found this helpful. If you have a question not answered here, post it in the reply box and we’ll do our best to answer it. Want to get an email every time we post? Use the subscribe links at the bottom of the page, and you’ll get an email when we publish. 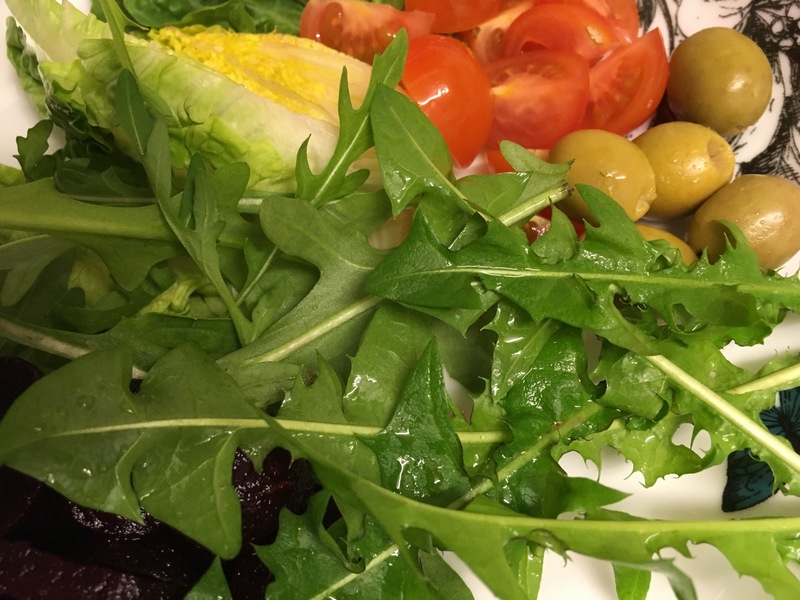 This weekend we took part in the #mygardenrightnow garden bloggers meme. 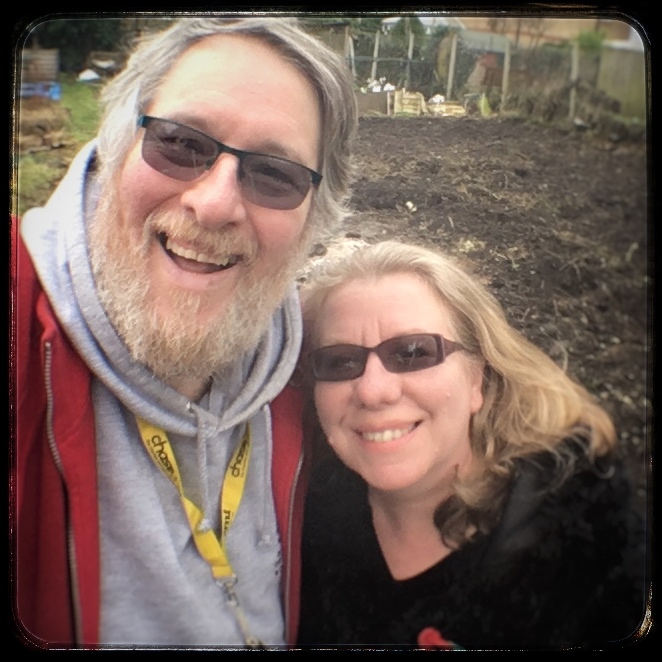 Michelle Chapman of the Veg Plotting blog suggested that we all take a photo of ourselves in our garden (or allotment) at some point over the weekend of 4-5 March 2017. The idea was to show what everyone’s garden looks like at the end of winter. So here we are on the Quest For Veg plot. To be honest, it was a flying visit because we had a big family birthday on the Saturday and a greenhouse to sort out on the Sunday (more of which later). 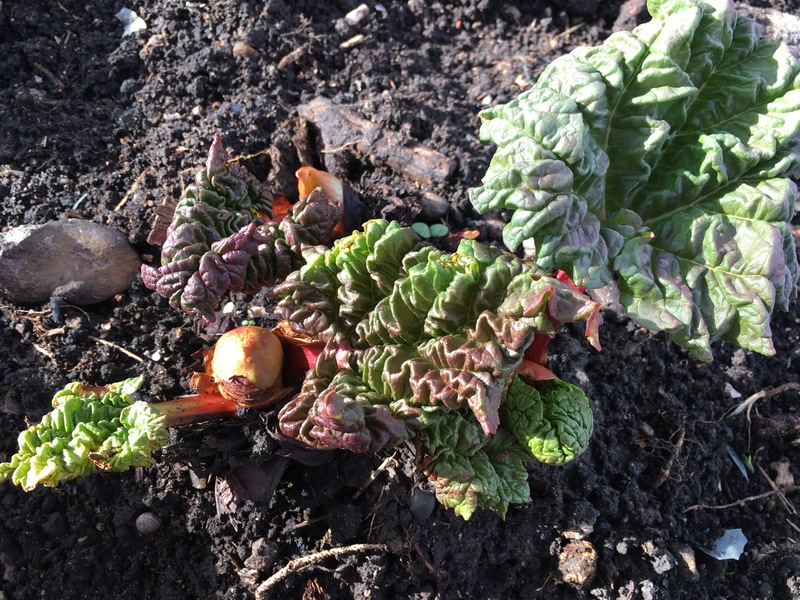 So, we just popped in to check on our rhubarb and the half a dozen herb plants that we bought last weekend. 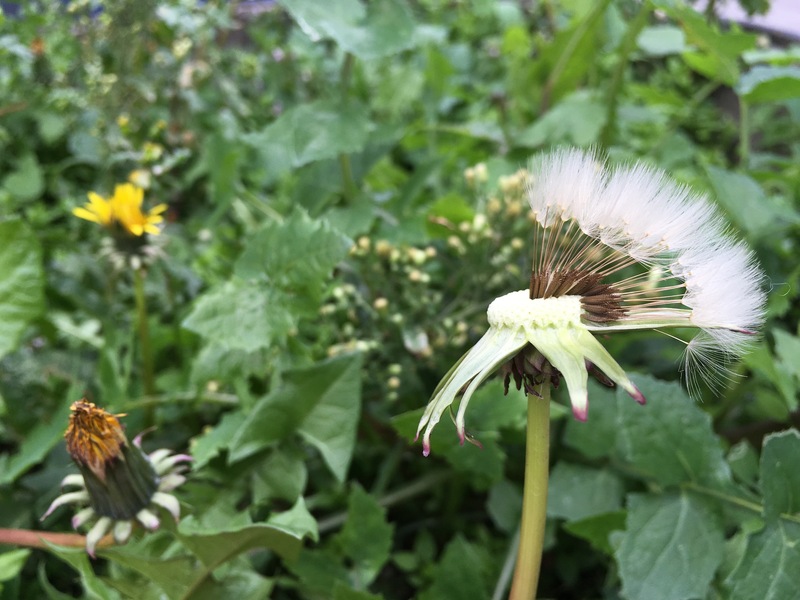 And to pull faces at the one or two weeds daring to show themselves on our freshly weeded ground! If you want to see what other participants were up to, go to Twitter or Instagram and search for #mygardenrightnow. Enjoy!